E-2000 is one of the strongest Eggman robots encountered in Sonic Heroes. Seen only in the last two levels, Egg Fleet and Final Fortress, and additionally, they can be found in Egg Emperor for Team Dark. These humanoid androids come equipped with an impenetrable forearm shield in one hand and a giant laser cannon in the other. This robot’s cannon releases a pink laser of some sort, which is big enough to cover even Omega and has a long range. Though the direction of the beam can’t change once it starts charging, it can sweep the cannon's direction a few degrees while releasing. This robot is also capable of moving around and doesn't have a big recharge time. When in shield stance, E-2000 models can't be harmed by any attack short of Team Blast. The best opportunity to damage them comes as they fire the pink death-beams, but still the robots take several hits to destroy even with third level attacks. When the Team is in Flying formation (and if the robot is not shooting), some if not all E-2000 will fold themselves up into a floating box-like arrangement, reducing their attackable area while maintaining the ability to fire their massive laser. They have 15HP and award 500 points when destroyed. An E-2000 firing its laser cannon in Egg Fleet. 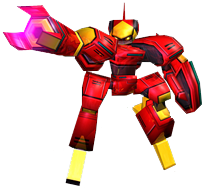 As with many enemies in Heroes, stronger golden models of the E-2000 are encountered on occasion (in Final Fortress), the E-2000R. The E-2000s were the highest-numbered E-Series machines in the Eggman Empire until the debut of the E-10000R and E-10000G Extreme Gear bots in Sonic Riders. Superficial similarities suggest that the E-2000 model may have been the design inspiration for the smaller and sleeker Egg Gunner design deployed against Soleanna in Sonic '06. This page was last edited on 28 September 2018, at 15:09.